Pressure Washing Can Make a Huge Impact On The Appearance of Your Home. 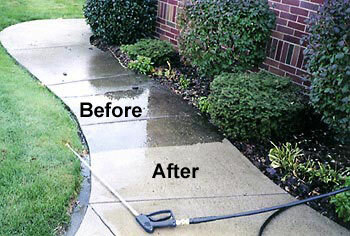 The difference that pressure washing can make on various surfaces around your home can be amazing. Of course, there are some surfaces for which pressure washing is an ideal mode of cleaning and others for which is should be used only as a last resort. Roofs immediately come to mind as an example of the latter as there are more gentle alternatives available. Concrete, however, is a great example of a surface that responds well to periodic power washing. Siding, decks, gutter exteriors, driveways, walkways, patios and retaining walls are all surfaces where pressure washing can work wonders. Each of these surfaces requires its own unique pressure level and technique. All Surface is equipped with a variety of power washing machines and different attachments to ensure that we have the right equipment for the job. Even with the right equipment, power washing can be a messy project. Being in the cleaning business, we hate to do anything that might actually make a mess. Yet at times, that is just what we are asked to do! Power washing, even with experienced cleaning technicians using the right equipment, can create a lot of peripheral messiness. A prime example would be a walkway that has been freshly bark dusted or has flowers planted right up to its edge. Even when the spray is directed in the opposite direction, there is almost always going to be “back spray”, water that bounces back in the direction from which you’re spraying. The point of mentioning this is that we want everyone to have a proper set of expectations and to communicate any special concerns or considerations so that we can do our best to address them. If you have some surfaces around your home that you are ready to have cleaned up, have us stop by and give you a FREE estimate today for our power washing services. For your next Power Washing Project contact the experts at All Surface Cleaning!